The world’s first ‘Kitten Kuddle’ took place at The Moggery HQ in Bishopston on the afternoon of Saturday July 14. 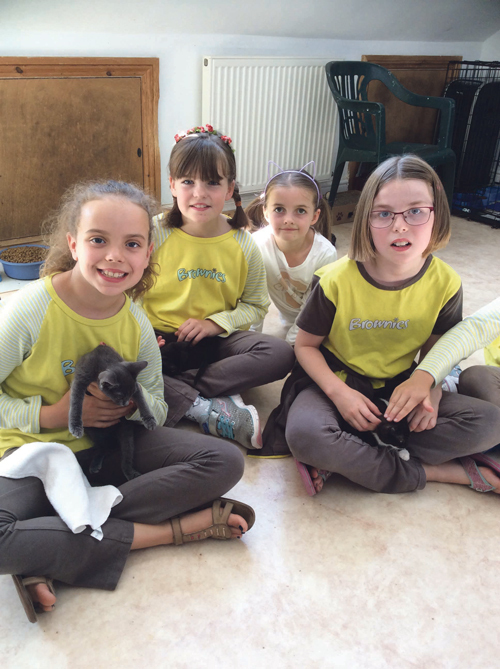 Brownies from the 93rd St Albans branch sat and cuddled the many homeless kittens in care at The Moggery. Founder Christine Bayka gave a talk to the group in February as part of the girls’ animal care badge and invited the girls to take part in the sponsored Kuddle when the Moggery was full of kittens in the summer. £120 has been raised so far which is urgently needed for kitten food. If anyone can offer a home to a pair of adorable baby kittens please call Christine on 0117 924 3128.